represented William Levitt's return to homebuilding in the United States. Begun in 1976 as the Orangewood planned-unit development by two former executives of Levitt and Sons, the project was soon in need of capital to continue construction. Only a portion of Lime Tree Village had been completed when William Levitt--through his own company, International Community Corp.--took over the project. Announced in 1978 as "Levittown, Florida" by William Levitt, controversey quickly ensued due to his use of the trade name "Levittown," which had been sold along with the company of Levitt and Sons to ITT. ITT had since divested of Levitt and Sons and the company was now owned by Starrett Housing Corp., which was operating the company as the Levitt Corporation, of which Levitt Homes was a subsidiary. As a result of litigation, William Levitt changed the name of the community to Williamsburg prior to its opening. Although the brochure reads that the community is named in honor of Williamsburg, Va., it has been presumed that Williamsburg was a way of maintaining some aspect of Levitt's own name--instead, his first name--since he had been prohibited from using the Levittown brand name. Since the Orange County community would be the first of two named Williamsburg, it is clear that Bill Levitt intended Williamsburg to become the new brand name for the communities he would develop under International Community Corp.
* Lime Tree Village was the first section of Orangewood, begun in 1976. The street naming and plat pre-date Williamsburg. ** Somerset Village was the final section of Williamsburg by International Community Corp. 85 partially finished homes and remaining homesites were completed by Unibilt Corp. beginning in September 1986. "the Adult Club Community at Orlando"
Location: Orange County, Fla., south of Orlando. Williamsburg Exhibit Center and sample homes located at 10309 International Drive. 9,000 homes planned in 20 villages of 325 homes each. Approximately 2,000 homes constructed in 6 villages. Community type: Planned unit, separate residential neighborhoods or villages with commercial uses located between residential uses. Street naming: Alliterative by section name (except streets previously platted for the Orangewood planned unit development in Lime Tree Village, which are primarily alphabetical). Official web site for Williamsburg. View the Welcome Letter accompanying your brochure when you inquire by mail. 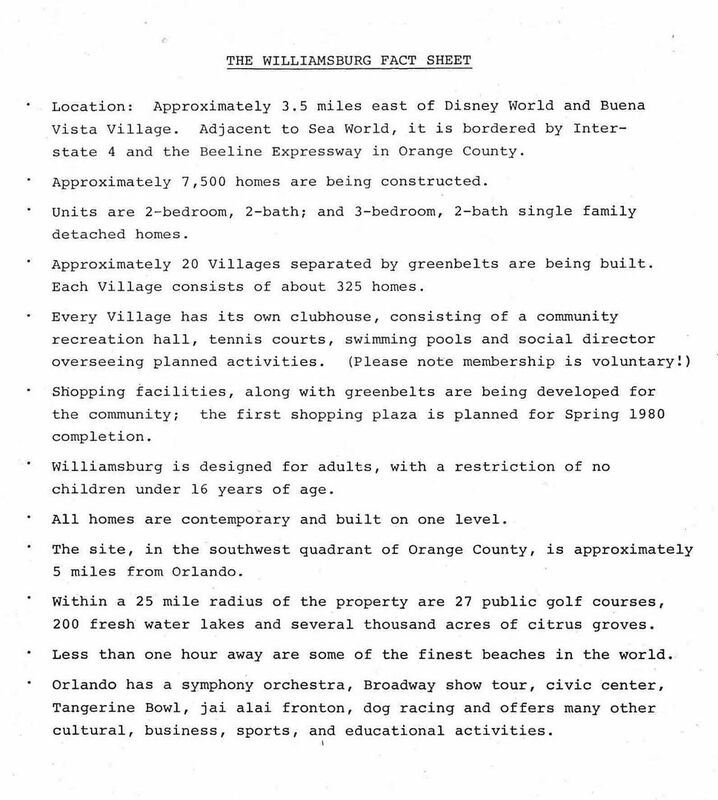 A Fact Sheet introducing the Williamsburg concept also accompanied inquiries by mail. View the Front Cover and Back Cover of the Information Booklet introducing the new community of Williamsburg, Florida, and the 1980 homes. View the Community Profile and General Information for Williamsburg. Read about Williamsburg's village plan with tennis courts, a pool, and club house at the center of each one. View the Price List for 1980 for homesites in the Windmill Pointe Village neighborhood. View the Standard Features included in your new home at Williamsburg. Tour all six sample homes--homes are contemporary, open-plan on one level for easy living. Home styles are varied and exteriors are finished in wood, stucco, and flagstone. All homes have 2 baths and 2 or 3 bedrooms. And in keepng with Bill Levitt's tradition, homes are complete--that means the sale price includes central air-conditioning, landscaping, underground sprinklers, and appliances by General Electric--refrigerator, range and hood, dishwasher, clothes washer and dryer. To maintain the aesthetic beauty of the community, all utilities are underground--no overhead lines! Even a 10-year Home Owner's Warranty is included. And beginning in Windmill Pointe Village, wall-to-wall carpeting is included. Additionally, Club membership is completely optional. At $35 per month, membership includes use of club house facilities, swimming pools, and tennis courts, and lawn maintenance so you'll have time to enjoy all the amenities of the community and Central Florida! Rancher. 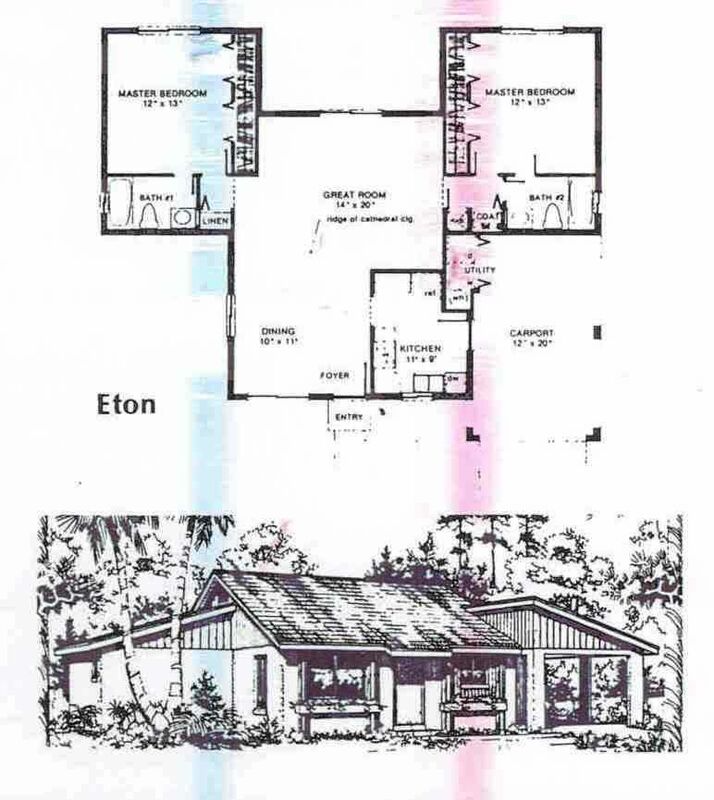 2 Bedrooms, 2 Baths, Living-Dining area with Dual Sliders to back lawn, Kitchen with peninsula open to Dining area and Carport Access, Bedrooms with wall-wide closets, single Carport with enclosed Laundry-Utility Room, Optional Rear Screened Porch. Rancher. 2 Bedrooms, 2 Baths, Columned Entry Portico, Expanded Living-Dining area with Dual Sliders to back lawn, Kitchen with peninsula open to Dining area and Garage Access, Bedrooms with wall-wide closets, One-car Garage with Laundry-Utility area. Rancher. 2 Bedrooms, 2 Baths, Entry with Beamed Trellis, Living-Dining area with Dual Sliders to back lawn, Kitchen with peninsula open to Dining area and Carport Access, Master Bedroom with Walk-in Closet, Master Bath with separate Vanity area, Bedroom 2 with wall-wide closet, single Carport with enclosed Laundry-Utility Room, Optional Rear Screened Porch. Rancher. 2 Bedrooms, 2 Baths, Covered Entry, Expanded Living-Dining area with Dual Sliders to back lawn, Kitchen with peninsula open to Dining area and Garage Access, Master Bedroom with Walk-in Closet, Master Bath with separate Vanity area, Bedroom 2 with wall-wide closet, One-car Garage with Laundry-Utility area, Optional 2-car Garage. Rancher. 3 Bedrooms, 2 Baths, Entry Foyer with Guest Closet and Carport Access, Rear Living-Dining area with Dual Sliders to back lawn, Kitchen with peninsula open to Dining area, Master Bedroom with Sliders to back lawn, Master Bath with separate Vanity and Dressing area, Bedroom 2 with Dual Closets and access to Main Bath, Bedroom 3 with wall-wide closet, double Carport with enclosed Laundry-Utility Room, Optional Rear Screened Porch. Rancher. 3 Bedrooms, 2 Baths, Entry Portico (Elevation C only), Entry Foyer with Guest Closet and Garage Access, Expanded Rear Living-Dining area with Dual Sliders to back lawn, Kitchen with peninsula open to Dining area, Master Bedroom with Sliders to back lawn, Master Bath with separate Vanity and Dressing area, Bedroom 2 with Dual Closets, access to Main Bath, and Sliders to back lawn, Bedroom 3 with wall-wide closet, 2-car Garage with Laundry-Utility area. Rancher. 3 Bedrooms, 2 Baths, Covered Entry, Rear Living-Dining Room with Cathedral Ceiling and dual Sliders to Rear Screened Porch, Eat-in Kitchen with Garage Access and Half Wall open to Dining Area, Master Bedroom with separate Vanity area, Walk-in Closet, and Sliders to Rear Screened Porch, 2-car Garage with Laundry-Utility area. Rancher. 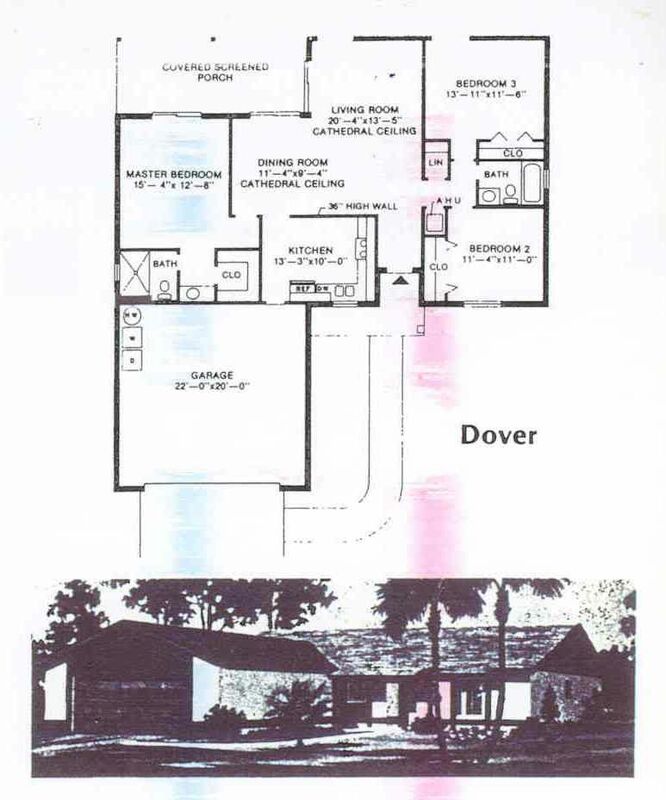 2 Bedrooms, 2 Baths, Covered Entry, Front-to-Rear Great Room with Cathedral Ceiling, Dining area, and Sliders to back lawn, Kitchen with Carport Access, Dual Master Suites with wall-wide Closets, single Carport with enclosed Laundry-Utility area. View press releases and news articles for Wiliamsburg. View original newspaper sales advertisements for Wiliamsburg. When Bill Levitt sold Levitt and Sons to ITT in 1968, the deal included $92 million in ITT stock. It also included a covenant that Bill was not permitted to enter the homebuilding business for a period of time if he were to leave the new ITT subsidiary of Levitt and Sons. Levitt did leave the company in 1972 for various reasons and, for a time, pursued other business ventures in the U.S. and attempted to pursue homebuilding projects Iran and Venezuela. In 1977, Bill's non-compete clause had expired and he was free to return to the homebuilding business in the U.S. However, he was not permitted to use the tradenames of Levitt, Levittown, and Strathmore in conjunction with homebuilding projects, since these were sold along with the company to ITT and would ultimately be sold to Starrett Housing Corp. in 1978. With the Orangewood planned development, the opportunity Bill had been looking for finally presented itself. By any measure, for most builders, a 2,000-home development would be considered a major success. In fact, Levitt and Sons had developed many more diversified communities in the 1960s that did not even reach this number of homes under its new business model, while still developing larger, longer-term planned communities in several locations. Levitt was probably somewhat a victim of his own success. Expectations were certainly high given his previous reputation and Levitt's own initial publicity--at first announcing a $600-million, 10,000-home "Levittown"--would have only given prospective buyers a reason to expect more as well. Many of the prospective buyers were targeted in the Northeast, having been previous owners of Levitt homes now reaching retirement age. It would almost have been nostalgic to relive the days of buying a new Levitt home in a brand new community being planned on a large scale. But in the time that Bill Levitt was not building homes in the U.S., a lot had changed in the industry. There were a lot more controls in place aimed at shaping developing communities. Environmental regulations had also been implemented in the 1970s, with good reason, that made the approval process lengthier and more restrictive, and ultimately added to the cost of a project. 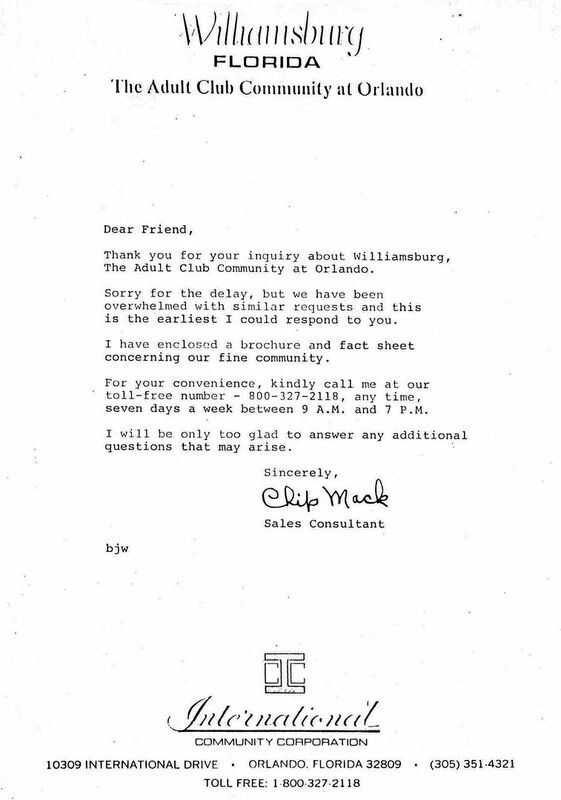 Lastly, Bill Levitt's ICC likely did not have the type of cash flow that Levitt and Sons once had, so that defects in construction were not as easily and readily rectified before they could get out of control and the media could publicize them, effectively hampering the development plans. Numerous articles about earlier Levitt communities reveal that new residents often experienced issues with their new homes, as one might expect with new construction, but that Levitt had always returned to make timely repairs. In some respects, it was just part of pioneering a new community. The initial problems at Williamsburg were not much different. In the initial phases of the development, many of the homes had leaks in the adobe tile roofs. The repairs took long to make and this feature was ultimately discontinued in favor of traditional asphalt roof shingles. But the damage had been done and the County was watching and waiting. The County halted work on the development in 1984 mid-construction in the Somerset Village neighborhood when ICC had not completed Central Florida Parkway to U.S. 441, as was reported to have been agreed upon by ICC. However, the intial planning approvals only required extension of the parkway if Levitt were to expand development to the east of Shingle Creek. All of Williamsburg is to the west of Shingle Creek. Although the homes at Williamsburg were sold as part of an age-restricted community, enabled through deed restrictions, the community is no longer age-restricted as of 1991. The Department of Housing and Urban Development (HUD) allows communities to be age-restricted if they meet certain criteria, one being that at least one member of the household must be at least 55 years of age in at least 80% of the occupied homes. Such an allowance is granted in the form of an exemption from the Fair Housing Act Amendments of 1988, and subsequently the Housing for Older Persons Act (HOPA) of 1995 federal regulation. The orignial deed restrictions for Williamsburg required only that no children under 16 years of age may reside in the household. There were no restrictions established requiring any other minimum age for at least one occupant of a household. As a result, the restrictive covenants of each of the homeowners associations for each village had to be amended to be eligible for the exemption. Four of the village associations--Lime Tree, Montpelier, Windmill Pointe, and Lake Ridge--had amended their restrictive covenants through approval by the necessary majority of the homeowners in order to qualify for the exemption. However, the original restrictive covenants did not allow for amendment of the age requirement provision. The amended restrictions were declared null and void and the community was opened to all ages.